Many aspiring piano players get too intimidated at the beginning. They think that playing a piano is inseparable from intricate chords that are difficult to grasp. 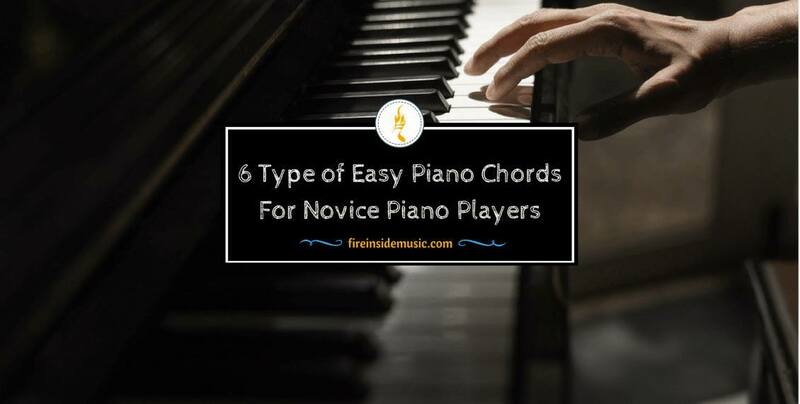 Thankfully, it isn't so: there are a lot of easy piano chords for you to play. In fact, it similar to playing the guitar – the majority of essential chords is pretty simple and straightforward. Of course, there are complicated ones as well, but you don't need them at first. There are literally hundreds, if not thousands of songs that you can play once you master a few basic chords for the piano. And the great thing is that you can learn all of them fairly quickly – in a single day! Learning the chords isn't the problem – mastering them is the tricky part. However, with enough practice and perseverance you'll be able to play the piano in within a reasonable period of time. 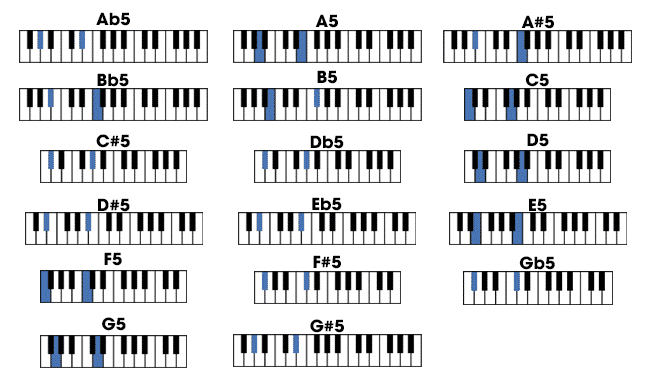 Now, let's learn some of the most basic piano chords you can use as you're starting out. If you're just about to take up the piano, there's one thing to bear in mind. Perhaps you shouldn't start out with complicated stuff, such as sheet music or music theory in general. If you already know a thing or two about this, that's great, but don't force yourself into it. Those things will come in later, if you need them, but it's up to you. Maybe you're not planning on becoming a music scholar or a professional player. In that case, things such as music theory will only end up overburdening you. In the beginning, all you need are simple chord positions, and you'll find your way from there on. The problem is that some of the more experienced pianists tend to make piano –playing seem too complicated, or too "expert-like". It's not at all like this. Actually, it's way easier than what many piano courses and tutorials try to tell you. Also, another thing to avoid at the beginning is thinking about the rhythm of a song. Yes, rhythm is inseparable from a sing, in fact – that's what makes a song "go", but you don't need it at the moment. First, you'll focus just on the chords and chord positions, and the rhythm will come at a later stage. However, what you do need to work on, from the very beginning, is your hand coordination. Piano cannot be played with only one hand – it simply wasn't made for that. Yes, you can form a chord with only your left or your right, that's true, but there's a slight problem to this. Forming a chord doesn't mean playing a chord. Imagine, for a second, a guitar. You can form a chord with only one hand i.e. you can put your fingers in a proper position. However, in order to play it, you have to strum the strings, right? So, there you have it – don't confuse forming a chord with playing it. Therefore, in order to learn basic piano chords properly, start out by practicing ﻿﻿﻿﻿your ﻿﻿hand coordination. There are tons of tons of interactive exercises for coordination practice, so do check them out before you delve deeper into piano playing. If we break it down, we'll see that the easy chords for the piano are really, really easy. Although there are chords with four or even five notes in them, there are those with only two, three notes. Just like with the guitar, the basic chord division for the piano is between major and minor chords. However, it's better if you first learn how to play major chords. The reason for this lies in the fact that major chords are the most common piano chords of all. This practically means that all other chords are contained "within" a major chord. In order to play a minor chord, or some other fancy chord used in jazz, for example, you only need to make slight adjustments to a major chord. In easier to do this, that to go from a minor chord to a major one. This is why most piano players consider major chords the foundation of piano playing. In order to play a major chord, you need to play the first, third and fifth note of a major scale. The best way to form a chord is by finding the so-called root note. The root note is the one that gives the name to the whole scale. So, if you want to play a C major chord, you should find a C note as its root note. The order of notes for C major would be C-E-G. If you want to play G major, you should find the G note as the root. Here, the order of notes would be G-B-D.
All of these note sequences follow the aforementioned rule: first, third and fifth note of a scale. Of course, you don't have to learn the scales in order to play the piano. You can do it even without any knowledge of scales. But it may come in handy once you develop your playing skills because you will move up and down the keyboard with ease. 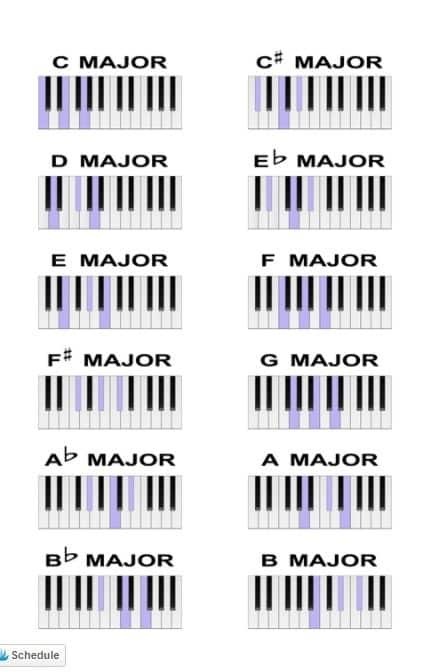 Anyway, it's good to know how chords are formed and in the case of piano major chords – it's quite easy. Knowing major chords is highly beneficial, but without minor chords – you'll be cut off from a lot of things. The good thing for minor chords is that they are very easy to learn once you know the major chords. Now, as for the forming of minor piano chords, there's a little trick. They are also formed with the first, third and fifth note in a major scale, but the third note is flat. 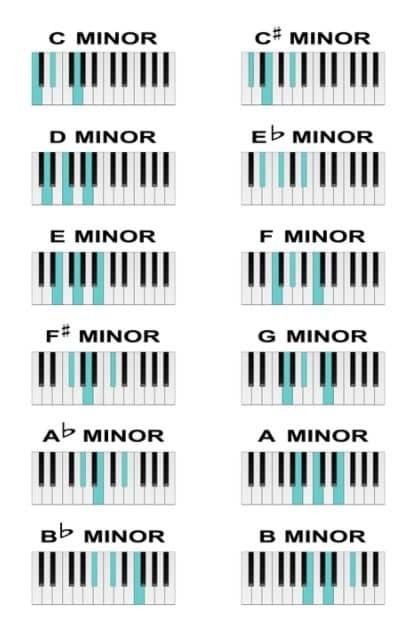 Well, if all the notes in a minor chord were the same as in a major chord, there wouldn't be any difference between them. So, in a minor chord, the third note is lowered for one semitone; a semitone is basically one-half of a note. Lowered or flat notes - ♭, are the exact opposite of raised or sharp notes - #, which are raised for one semitone. So, a minor piano chord differs from a major one by having its third note lowered for a semitone. In the case of C minor, its lowered third note would be E♭, and it's played on a black key, rather than on a white one. So, instead of playing a C major, you simply move your index finger to a black key left of its position. Then, you immediately get C minor. Now, you can expand upon your knowledge of piano chord and play around, turning major chords into minor ones with this simple change. Apart from piano chords that are formed with three, or more notes, there is also the simplest chord of all – 5 chord. Now, you may get confused by its name, but don't worry. The 5 chord isn't called that because it's comprised of five notes. The name "5 chord" comes from its formation, as it's formed with the first and fifth note of a major scale. Therefore, although it's called the 5 chord, it actually has only 2 notes, which is very easy to play. To form it on the ﻿﻿keyboard, you simply find the root note and add to it the fifth note of the scale you're in. You can literally count the white keys from C up to G, and form this chord right away. Don't let the name frighten you. Although it may sound strange and complicated, the suspended chord is very easy to play. Also, it's very often used in contemporary music. If you ever come across a Sus chord, know that it's basically the same thing, as this is an abbreviated form of the word "suspended". Basically, it's formed with the first, fourth and fifth note of a major scale. You play just like you play all the other chords we mentioned, as the principle is the same. Find the root note, and then add to it the fourth and the fifth note, which are in this case side by side on the keyboard. This is one of those magical chords, which really add extra flavor to a song. An interesting this about Sus chords is that they tend to resolve to a major chord of the same group. Again, this may sound complicated to you, but it's not. Music resolve means the way in which one chord is drawn by another, how it has a "need" to flow into another one. In the case of Csus chord, its logical counterpart for resolve would be C major, as they belong to the same scale, the C major scale. This goes for all the scales and chord groups. You can often use the Sus chord to bring a song, or a chorus, to the end, and then actually end it with a major chord. Some people call this chord the 2sus chord, to avoid any confusion with the number of notes. However, it's mainly known as the 2 chord, and not because it has two notes, but for another reason. It uses the second note on a scale to be formed, and hence its name. You start with the root note, then add the second and then go up to the fifth, and you have a 2 chord. It's a kind of cousin to the suspended chord, only it uses a note right after the root note of a scale. It's often used, and you can learn it quickly if you already know how to play a major chord. If you get bored with playing a major chord, or you want to add that extra something to it, you can play a 2 chord in the same finger position. This way, you'll also practice your finger-locking and proper positioning while playing. How to Read Piano Notes: The Guide for Beginners! All the chords that we've mentioned are pretty easy and straightforward, so you shouldn't have problems mastering them. 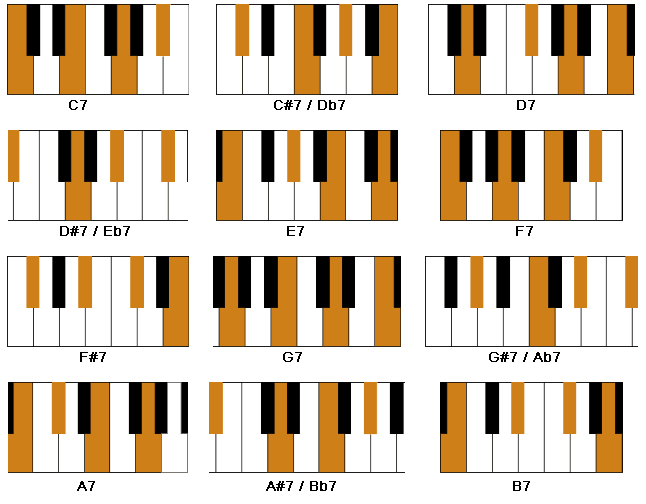 However, there's another group of so-called basic piano chords we haven't mentioned – the seventh chords﻿. A seventh chord is basically a major chord to which we add the seventh note of a given scale. Yes, seventh chords are easy in that way and you could definitely try playing them. All you have to do, as we said, is to add the seventh note to the major chord you're playing. But in order to do this – you have to use four fingers. And that's the tricky part. If you're a beginner, and you're just starting out, this might be a bit too much for you at the moment. Especially because you have to use both hands in order to play properly. So, you might want to keep away from major seventh chords for the time being and focus instead on those that we've covered here. After a while, once you become more experienced and skillful, you'll easily incorporate major seventh chords into your piano playing. The same goes for minor sevenths – they can be a bit complicated for novice players, so put them off for a couple of weeks. Once you learn the basic majors, minors, 5 chords, Sus chords and 2 chords, you playing abilities will skyrocket. There are literally dozens, if not hundreds of songs that can be played by using three chords or four at the most. The best thing is that you do not have to be a virtuoso to be able to play well. All you have to do is learn the basic chords and make sure your fingers are positioned properly. Enjoy your piano playing, and keep practicing on those chords!